Experience faster charging speeds than ever before with Samsung Adaptive Fast Charging. Using the built-in technology of your latest Samsung Galaxy phones you can rapidly recharge your device. No more hanging about, just super quick charging. These phones support Samsung’s Adaptive fast charging feature and Qualcomm Quick Charge 2.0 technology. 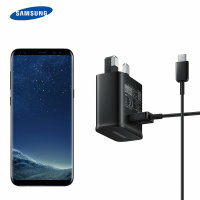 Also included with the mains charger is a 1.2m USB-C to standard USB-A cable, which is perfect for charging and syncing data to and from your USB-C Samsung device - including the Galaxy S8 and S8 Plus. Please note: no retail packaging or box included.